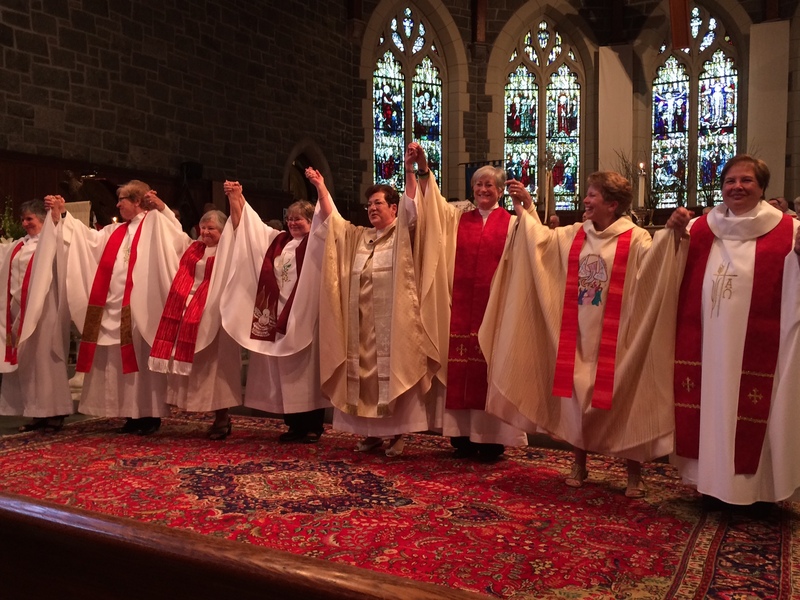 Here is the beautiful homily given by Bishop Andrea M. Johnson, RCWP on 4/25/15 at the Ordination of seven women priests from the Eastern Region of RCWP-USA. It is such a joy to be here in Morristown with all of you today — Jersey girl that I am – to celebrate together with you this historic moment in which we call forth and ordain seven new Roman Catholic Women Priests for the eastern USA. The first time there were seven ordained together was on the Danube River in June of 2002 when our movement began; and in 2006, eight women were ordained priests in Pittsburgh, PA, coming from the entire USA. This is the first time such a large number is being ordained for just one region of our country. We are so very grateful to be here at the Episcopal Church of the Redeemer, and want to express our deep appreciation to the Reverend Cynthia Black and the entire congregation for welcoming us here today. Our ordination liturgy began this afternoon with these words from our opening hymn: Let us build a house where love can dwell and all can safely live. What an awesome vision of who we seek to be as church – as the Body of Christ! What an apt description of the mission of Roman Catholic Womenpriests, standing firmly within the Roman Catholic tradition, yet pushing the envelope, and creating a safe and welcoming space for all who want to participate. The seven women who have come before us today seeking ordination to priesthood have prepared extensively, and they have discerned deeply. They have grasped and embraced our model of priestly ministry which is a servant model, an inclusive model that empowers all of God’s people. The readings chosen by the ordinands reflect their clear understanding that their call to ordination is a call – not to a leadership of privilege, but to a leadership of servanthood; a leadership that is prophetic in its demand for justice in our church and in our world. Indeed, as our reading from Isaiah says, these servants are called to “give life and spirit to people; to proclaim the covenant of love and fidelity that our God offers us; to give light; to heal; and to liberate.”These ordinands know themselves to be called to empower others so that those they empower can do the same for yet others. These women understand that, in order to serve,, they must first live by the Spirit, indeed follow the Spirit’s beckoning by living into the fruits of the Spirit – which include among them patience, generosity, gentleness and self-control – ….they follow the Spirit’s promptings, even as they struggle with the harsh realities of injustice and persistent inequities in our church and world systems. They are committed to seek out and to speak the truth as they minister, knowing that it is God’s Spirit who upholds them and leads them into all truth and all true unity. As we in Roman Catholic Womenpriests approach thirteen years of existence as an initiative within the Roman Catholic Church, seeking to break open the model of ministry to include women and all baptized persons called by their communities to priesthood; and with those descended from the Danube ordinations of 2002 now numbering more than 200 worldwide, how can we describe our mission to ordain, and our vision of church going forward? In real terms, how does our vision of inclusivity play out in a church whose structures have historically and increasingly disenfranchised the many? We believe our call to priesthood is rooted in our baptism, and is sustained by a reflective, contemplative and prayerful lifestyle which seeks to follow in prophetic obedience where the Spirit leads us. We believe we are called to model a new way of leading which strives to empower others, to work with others in our communities to mobilize resources to serve the disenfranchised, to release creativity, and to enable stable communities to form and thrive. Most importantly, we believe we ensure, by providing priests to a renewed and emerging Catholic church, that the subversive memory of Jesus is perpetuated through the proclamation of the Word and the celebration of the sacraments, especially the eucharist, which is the core of our commitment to unity with one another – the unity that binds us in the One Body of Christ. Nourished by Word and Bread, we, together with the whole people of God, call forth the gifts of the community to do the work of justice, peace and integrity of life. As for the communities we serve, they are diverse; nonetheless they are all characterized by a new spirit of collaboration. What do the communities committed to renewal and led by Roman Catholic Womenpriests look like? There is meaningful ecumenical and interfaith outreach. And so, today, we are truly thankful to our loving and compassionate God, who has given us an abundance of new servant leaders to continue to grow this movement for a renewed priesthood and church, and to discern a new understanding of what it means to be catholic – of what it means to be One Body in all of our diversity.